T-Mobile cycling team has suspended Serhiy Honchar for 30 days pending further analysis of a blood test. Honchar will not compete while he undergoes follow-up tests and a medical evaluation, the German team said Friday. "The blood test results ... are within all UCI (international cycling union) limits, and no doping violation has taken place," the team said. Honchar was tested by independent medical personnel at a race in Liege, Belgium, last month and during the Tour of Romandie earlier this month. The follow-up test procedure has been recommended by the team's independent medical advisory board in consultation with the UCI, T-Mobile said. The decision was announced a day before the start of the Giro d'Italia. 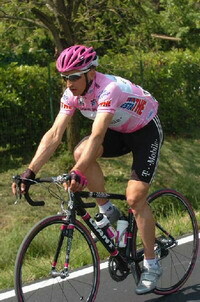 Honchar had not been included in T-Mobile's list of riders for the race.